A cataract is a clouding of the lens of the eye that reduces the clarity of vision. Cataracts often affect both eyes but may occur unevenly. The breaking down and clumping of the eye lens tissues is what causes the clouding effect. While some cataracts can be hereditary, others are caused by injury and exacerbated by disease or even medication. However, most cataracts occur as part of the normal aging process due to overexposure of harmful UV rays from the sun. Nuclear Cataract: As the name suggests, this cataract develops in the nucleus (the inner central zone) of the lens. This type of cataract commonly occurs among the aging population. Posterior Subcapsular Cataract: develops on the back side of the eye lens and often affects diabetic patients. Consuming steroid medicines in high doses could also increase your risk of developing this kind of cataract. Traumatic Cataract: This type of cataract often develops after an incident that causes an injury to the eye. Cortical Cataract: White, wedge-like opacities often characterize this age-related cataract. The lens cortex is the most commonly affected, as it surrounds the eye’s central nucleus. Congenital Cataract: Some children are born with this type of cataracts or might develop them during childhood. It commonly affects both eyes but can be so minor that vision is not affected. Many factors can lead to the onset of cataracts, including inherited genetic disorders and medical conditions such as diabetes. However, most people develop cataracts as a result of the normal aging process or injury to the eye. 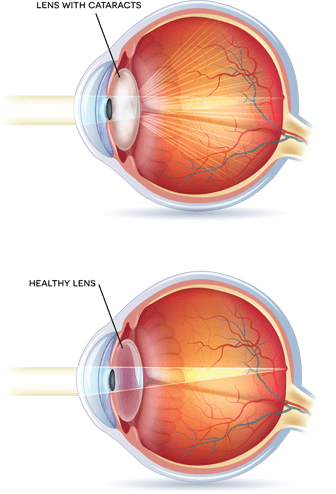 As the normal aging process occurs, tissues surrounding the eye lens begin to break down, clump together, and result in clouding in parts of the lens. As the cataract develops, the clouding spreads to larger areas of the lens, thereby blocking light from passing through the lens. This prevents sharp, in-focus images from reaching your retina, which is commonly referred to as blurred vision. When a cataract develops in one eye, it is more likely to spread to the other eye and cause each eye to have different vision. Visual Acuity Test: During this test your doctor will have you read a series of letters from an eye chart. Your eyes will be tested individually. The doctor will determine if you have 20/20 vision or if you have any signs of impairment. Slit-Lamp Examination: This exam uses a microscope called a slit lamp that allows your doctor to see certain parts of your eye under high power magnification. It uses a high powered line of light (slit) to illuminate different parts of your eye which can help your doctor detect any abnormalities.